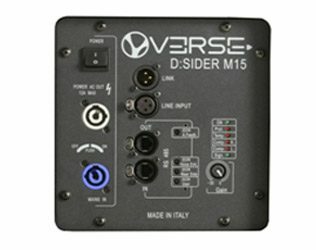 D:Sider M12 is a full-range, high performance, compact size, stage monitor with high quality sound and light weight. Thanks to a very linear response curve and the specially designed angular coverage, D: Sider M12 is ideal for live concerts and for every need of monitoring. It is equipped with a special coaxial loudspeaker designed to our specifications, which gives a clear and deep voice and a bright sound to the middle frequency and precise high frequencies. Like the whole D: series, D:Sider M12 is equipped with the usual digital signal processor with remote control and direct access functions (antifeedback, near side, voice enhancer) for the more usual circumstances of use. 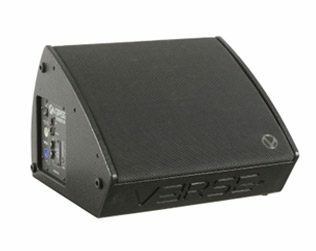 mm 440 x 370 x 490 - 17.32" x 14.56" x 19.29"
The D:SIDER M12/M15 monitors are full-range stage monitors of high-performance, compact size, low weight and high sound quality. Thanks to the linear response curve and the specially designed angular coverage, these monitors are ideal for live and an all monitoring situations. The monitors are equipped with a special coaxial speaker, which gives a precise and deep voice and a clear sound to the midrange and accurate high frequencies. They are equipped, as all the D series with a digital signal processor with remote control and direct access to functions (antifeedback, near side, voice enhancer) for the most common use cases. In addition to the audio connections, the D:sider’s Connector panel has RS485 sockets to connect to a computer.